Extract the archive somewhere on your harddrive. Run ProTrekkr by doubleclicking on its icon. - Added effect 28: turn track LFO on/off. and the whole commmand column is now properly filled with the first value. - Input was partially disabled when caps lock was turned on. will now increase/decrease value by 8. - F5 to F9 keys now jumps to 0, 1/4, 2/4, 3/4, 4/4 of the patterns lines. and save them within the .ptk module. to a MSVC compiler quirk. - 303 units speeds can now be scaled. - Added effects 26 & 27 (set reverb cutoff & resonance). - Some notes were missed in multi-notes channels sometimes. - Fixed a bug occuring with automatic note offs on the synth. - Ptk can now import DigiBooster v1.x modules (.digi). 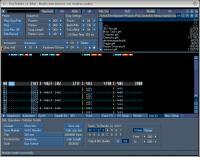 - Tracker could hang sometimes when calculating a song length. (making it sound a bit less metallic). - Added an option to tune the 2 303 units together. - Tracker crashed when using insert command on track 0. - Tracks are only shadowed during playing. - Added cutomizable resonance for reverb filter. - Autosave function was broken. of any existing old module version before overwriting the new one. - Reverb threshold delays table was lacking some values. - Improved midi in/out support (notably by adding velocity). as they're used for midi output. - Added 3 new themes. - Tracker sometimes crashed at exit when using midi. - Mouse wheel activated for horizontal patterns slider. - Fixed a small issue with vu meters values. - Number of effects columns is now selectable (from 1 to 4). - Added synth oscillators combiner. - Each track now have separate volume. - Added lo/med/hi bands equalizers for each track. when updating track tab during play. and added stereo separation parameter. (jump to previous/next letter group for files lists). also improved (?) older modules to take advantage of new features. be loaded at startup (can load any file recognized by the tracker). (this can be used to associate .ptk files to the tracker). - Default repeat loop row is now 0 (was disabled before). - Glide effect (5) should now work with synth instruments. - Tracks data weren't displayed properly sometimes. - Fixed a bug in tracks filters. - Implemented insert or delete track functions. - Tracks can now be rendered to .wav in their own separate file. - Tracks panning changing are now smoothed. - Live recording strategy improved. from a midi device (like a master keyboard). - Added effect 25: Set shuffle value. - Metronome implemented (used during recording). - Fullscreen mode is now used with current screen resolution. - Handled latency at recording startup (so visuals should be synched to audio). - Fixed midi handling for big endian machines. - Fixed a bug in the reverb that only occured on big endian machines. by selection length and copy it's content into the newly created space. and insert zeroes into the newly created space. - Looks like the signal reduction hack is no longer necessary on Linux. - Linux 32 bit executable now available. - Window can now be resized. (used to clear selections without removing them from samples). - Fixed a small issue with patterns blocks selection. due to unrecognized packing schemes. - Fixed a bug that could freeze the tracker under AROS (& possibly Amiga OS4). - Fixed flanger filter (now using individual buffers / track). - Fixed 06xx command (was always jumping jumping 1 line too far). - Added loading support for 1, 2 & 3 channels FastTracker I modules. - Added flight.ptk & warlock.ptk. from large to small patterns view. - Some buttons weren't disabled properly in Disk IO tab. - Added buttons to reduce or expand the number of notes in each track header. - Max number of notes in a track is now 16. - Fixed 2 bugs in the replay (which can now be slightly smaller). - Lengths of individual packed waveforms are now displayed. or directly used to create instruments waveforms. - Added primitive.ptk by Mice of Brainstorm. with waveforms of more than 2 megabytes. (and not just the current pattern like before). samples packing is available on every platforms. codecs (a few kb kkrunched). - Properties.h files weren't always saved at the right place. resulting in some "scratchy" sound sometimes. - Added tracks compressors (can eat some CPU time). - Tracks polyphony was kinda broken. - Fixed a small issue with the flanger.